ynamic pace among small, high-quality wine producers is evident throughout California, and this is as much the case here as elsewhere in the state. As well as the more established cooler areas like the Russian River, new vineyards are now being developed on the Sonoma Coast with great success. Wine prices remain buoyant – a wealthy local market combined with scarcity among the top wines ensures this. There are great Cabernets here but this is generally Chardonnay and Pinot Noir territory, with some exceptional Zinfandel in warmer sites. Some magnificent wines, yes, but without the stratospheric prices of the Napa Valley collectors’ Cabernets. The North Coast of California is a vast area. It takes in Mendocino and Lake Counties, over 100 miles to the north of San Francisco, as well as Sonoma County, which runs southwards west of the Mayacamas Mountains and then takes in the western end of Carneros. The whole viticultural area is encompassed under the North Coast AVA. What enables such diverse vinegrowing is cool breezes and sea fogs that drift in through coastal gaps. The most significant of these – the Petaluma gap – provides an effective cooling fan for the vast Sonoma vineyard, north and south of the town of Santa Rosa. It is only thanks to these cooling breezes and sea fogs, which dominate the summer months along the state’s coastline all the way south towards Santa Barbara, that fine wine production is possible in California at all. Mendocino is a large, sprawling vinegrowing area, mostly cool and suitable for Pinot Noir and Chardonnay. The Anderson Valley, which opens up to the ocean, produces a number of restrained, stylish examples and is also an excellent source of sparkling wine. To the north-east are the warmer AVAs of Redwood Valley and Potter Valley. Some increasingly impressive Syrah, Zinfandel and Cabernet are grown here. 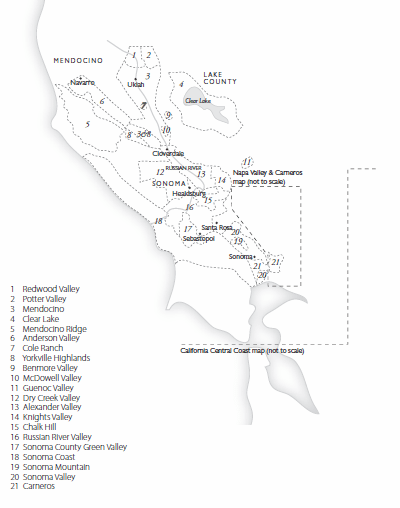 Lake County and the Clear Lake AVA, Guenoc and Benmore Valley sub-AVAs are located to the east, across the Mayacamas Mountains. Clear Lake and Guenoc are best suited to growing reds – Cabernet Sauvignon and Zinfandel – as well as a ripe style of Chardonnay and Sauvignon Blanc. Benmore Valley by contrast is significantly cooled by elevation and provides tighter, more restrained Chardonnay. This is really the heartland of North Coast vinegrowing and it includes the warm red-grape areas of Dry Creek Valley and Alexander Valley to the northeast. These are located to the west and east respectively of the meandering northern sections of the Russian River which runs through the towns of Asti, Geyserville and Healdsburg. Tremendous Zinfandel and Syrah can be found in both AVAs. Excellent restrained Chardonnay, structured Cabernet and meritage styles are all sourced from the higher mountain slopes of the Alexander Valley. To the immediate east of here is the Knights Valley, source of some first-class Chardonnay and Cabernet Sauvignon. Chalk Hill AVA is just to the south and is dominated by the winery of the same name. South of Healdsburg the considerable expanse of the Russian River Valley AVA opens out. To the far west on the Sonoma coast some very impressive Chardonnay and Pinot Noir is now being produced and takes the Sonoma Coast AVA. 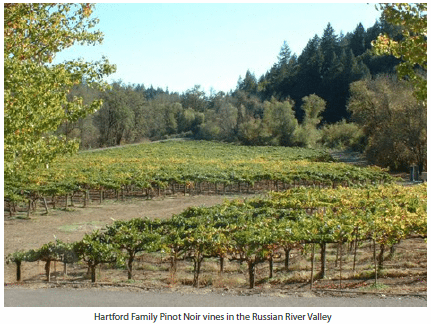 The Russian River area is now very well established as a source of exemplary Pinot Noir and Chardonnay and, in the warmer eastern sites, very good Syrah and Zinfandel. To the south-west is the distinctly cool. Sonoma Green Valley AVA, a source of top-quality sparkling wines and restrained styles of Chardonnay and Pinot Noir. Just to the south of Santa Rosa and nestled into the Sonoma Mountains is the new Bennett Valley appellation which is an exciting source of both Pinot Noir and Chardonnay and some fine Syrah and Merlot. The Sonoma Valley AVA itself is located to the south of Santa Rosa and is home to some of the largest producers on the North Coast. 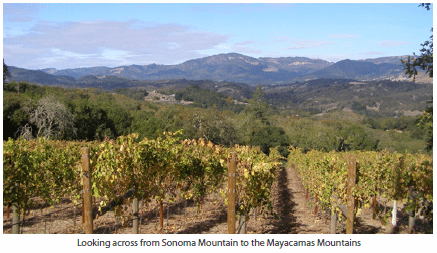 The valley is bordered by the Mayacamas range to the east and the Sonoma Mountains to the west. The appellation runs from north to south-east through the towns of Oakmount, Kenwood, Glen Ellen and Sonoma itself. The western range has its own AVA, Sonoma Mountain, and provides impressive examples of restrained Chardonnay, Pinot Noir and Cabernet Sauvignon. In general the better reds are planted in the warmer northern sections of the AVA while the southern sector that borders Carneros produces stylish whites but also good Pinot Noir. Some of the best and sturdiest Cabernet blends and Zinfandels are sourced from the higher slopes leading into the Mayacamas Mountains.